Sunday Night Football’s game of the week is once again another likely meaningless game as it pertains to playoff standings but still may draw viewers due the large markets of both New York and Washington. Both these franchise have had subpar campaigns and are fighting to not be in the cellar in the NFC East. The Giants hopes for a postseason berth last week were dealt a critical blow as they lost at home to the Dallas Cowboys 24-21. Dallas has swept the season series against New York, winning both games. While the Giants have not played well as a team overall, Eli Manning’s season has been the worst of his career by a large margin. He has a passer rating at 72.5 and has thrown 17 interceptions, the highest total in the league. New York as a team has committed a league-high 30 turnovers this season. The one bright spot for Giants offensively has been the play of Andre Brown the past couple weeks. He has rushed for over 100 yards in two of his first three games after returning from injury and has given the Giants a running game they have sorely been lacking. Backup running back Brandon Jacobs and goal-line back will also be out this week, so the Redskins will get all the Andrew Brown they can handle. Wide receiver Hakeem Nicks is listed as probable and will likely return this week after missing last week’s game with an abdominal injury. The Giants also lost center Jim Cordle for the season and will again shuffle around the line for Eli Manning. Defensively, it has been a mixed bag for the G-Men, but over the past five or so weeks their defense has been much better. They rank top ten against stopping the run, holding opponents to 98.8 yards per game on average. Their pass defense has also gotten better, but they still boast one of the worst pass rushes in the league. The Giants are second to last in seconds in the NFL with 18 with only the Jacksonville Jaguars with a lesser number. Their defense took a massive blow this Sunday when it was announced defensive end Jason Pierre-Paul would be inactive for this contest. The Redskins started off the season poorly and never seemed to right the ship on both sides of the ball. Most notably, second year quarterback Robert Griffin III’s play has been much different from his rookie campaign. Griffin had his worst game of the year last Monday night, throwing for a season-low 118 yards and getting sacked six times, the most in his career. The Redskins offense looked pitiful with him behind center in the 27-6 loss but has some bright spots. Second year running back Alfred Morris is third in the NFL with 970 rushing yards and is has had a splendid campaign. Tight end Jordan Reed will return likely return this week after getting a concussion in Week 11. He has an excellent matchup against a Giants defense that has struggled against tight ends. Defensively, Washington leaves a lot to be desired. They are 31st in the league in scoring defense with 30.7 points per game and 26th against the pass. They rank in the middle of the road at stopping the run, but that is just likely because they are much easier to pick apart in the air. Many advanced stats have them leading the NFL in missed tackles as a defense. This is one pathetic unit. The public is all over the Giants in this game. The Redskins opened at +1.5 dogs, but the line moved to pk but is now at Washington +1.5 mostly everywhere. The total opened at 46.5 and is currently listed at most sportsbooks at 46. This is one of those games that no one truly deserves to win, but I have to say I am shocked to see the Redskins as underdogs at home. The Giants have a 4-7 record while Washington sits at the 3-8, so it is not as if New York is a talented team that is underachieving. They have just been flat out inept, as well. After a poor performance from RG3 in prime time this week, and discussion about his worth to the franchise – this is a massive game for the young signal caller. I still do not think he is close to a benching yet, but he has the potential to lose his job with another performance like that. Even if, he is the franchise quarterback. The matchup is a good one for Griffin and the Redskins offense as the Giants are without their primary pass rusher in Pierre-Paul and have injuries in their secondary. Jordan Reed and Pierre Garcon should be open on Sunday Night and Alfred Morris should have plenty of room to run. It is all on Griffin to get them the ball, and I think he does that well in this one. If given time to throw or escape out of the pocket, he becomes a much better quarterback. 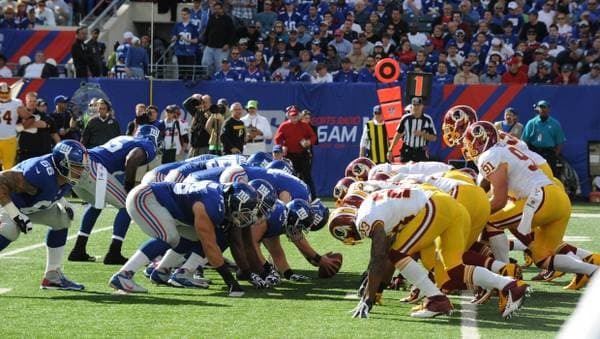 As far the Giants odds against the Redskins defense, it is another good one on paper, but how many times have we said that about New York this year? Eli Manning and the Giants have had some mouth-watering matchups – especially playing in the defensively inept NFC East – but have failed to take advantage time and time again. I think they will score some points, but the Redskins will do a better job on offense and put up huge numbers through the ground and air. Take the generous +1.5 with Washington at FedEx Field.